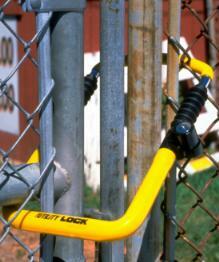 Keyed Alike Utility Lock. Each lock you order will us the same key. The Club Utility Lock is great for securing golf carts, ATV’s, scaffolding, ladders, gates, patio furniture, garden tools, power tools, trailers, motorcycles and thousands of other items. Length adjusts from 9 1/4 inches up to 12 3/8 inches. 6 ¼ “ Wide.